The Balanced Scorecard Templates for Excel are 10 professionally designed balanced scorecard templates that can be customized for monitoring business performance from alternative perspectives. Each of the balanced scorecard templates is configured to print on a single page and update automatically to underlying data. The generic scorecard reports are categorized into perspective categories of financial, customer, business process, learning and growth each with five customizable key performance indicators. Key performance indicators (KPIs) and business metrics can be customized and defined for any of the generic templates. The scorecard templates automatically update to changes in underlying Excel data. 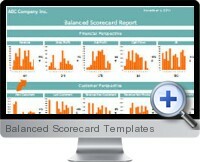 Two balanced scorecard PowerPoint templates are included for developing presentations. A balanced scorecard strategy map allows performing performance gap analysis between objectives, targets and actual results. A balanced scorecard readiness check list report assists to analyze and report ranking and readiness for implementation of balanced scorecard development goals. The download includes free upgrades to enhanced versions and material on best practices for business process improvements through balanced scorecard analysis.